Louis Kessler - Lorrayne & Co. - Eugene de Fontaine - Fontaine & Co.
William Henry Kessler was the son of Ludwig Kessler, a German-born musician, and his English wife Ann Waghorn (formerly Goldsmith). William Henry Kessler was born on 5th April 1859 at his parent's home on Victoria Road, Tunbridge Wells, Kent. Ludwig Kessler, William's father, was born in 1834 in the German state of Hesse. In 1855, Ludwig Kessler married Ann Waghorn (born c1834) of Kent and settled in Tunbridge Wells, where William and his brothers were born. The Kessler family moved to New Cross and then to Mile End in East London. Ludwig Kessler died in Mile End in 1872 at the age of 37. From this date, William and his brothers were brought up by their widowed mother in London. Initially, William Kessler earned his living as a musician, as his father had done before him. Around 1875, the young musician arrived in Brighton, where he met publican's daughter Eliza (Elizabeth) Bailey (born 1861, Brighton). 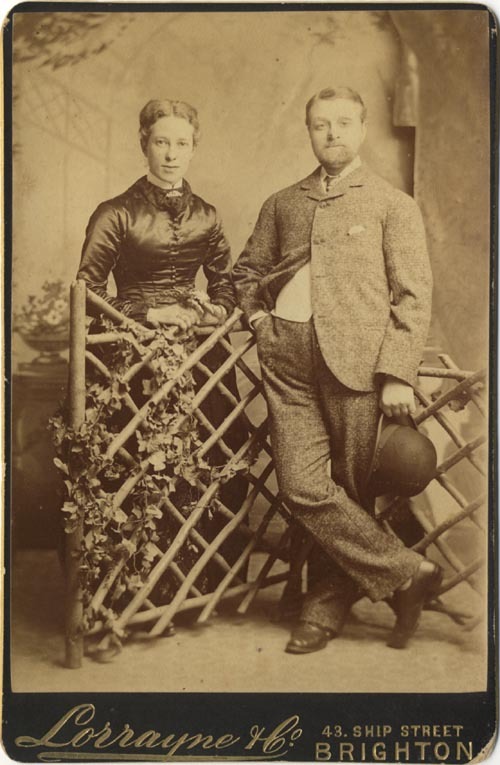 The couple married in Brighton on 11th December 1876. On the marriage certificate, seventeen year old William Kessler gave his occupation as "Teacher of Music". Two months later, on 11th February 1877, William and Eliza became the parents of a baby girl, who was named Mary Annie Louise Kessler. William and Eliza found lodgings at 17 Upper North Street, Brighton, where their son, Charles Ludwig Kessler, was born on 25th May 1879. By this date, William Kessler was working as a photographer as well as a musician. * Mary Annie Kessler, aged 4, was staying with relatives in London at the time of the census. Her place of birth was given as East Dulwich. William Kessler was possibly earning a living as an itinerant photographer and musician at the time of the 1881 census. 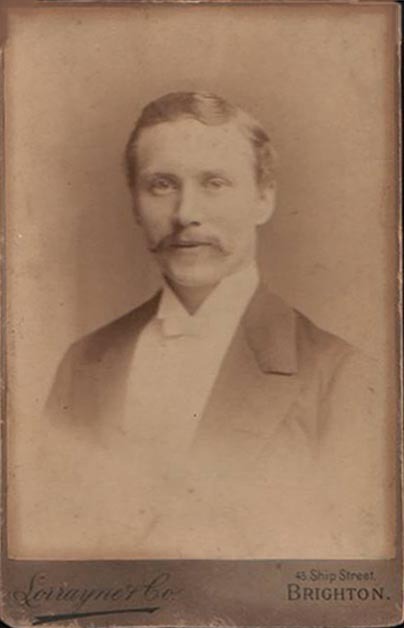 Eventually, William Kessler might have found employment in one of the thirty or so photographic studios which were operating in Brighton during this period. William Kessler's wife Elizabeth was pregnant with their third child when the 1881 census was carried out. On 26th July 1881, Eliza Kessler gave birth to a baby boy, who was named Arthur Francis Kessler. When young Arthur was christened at Brighton's Chapel Royal on 4th July 1883, William Kessler's profession was entered as "Musician" in the register of baptisms. [ When Eliza Kessler died in 1942, the informant advised the registrar that Eliza's late husband had been a "Music Composer" ]. William's fourth child, Harold Kessler, was born in Brighton on 18th July 1883. When Harold's birth was registered, William Kessler gave his occupation as "Photographer" and his home address as 10 Cheltenham Place, Brighton. 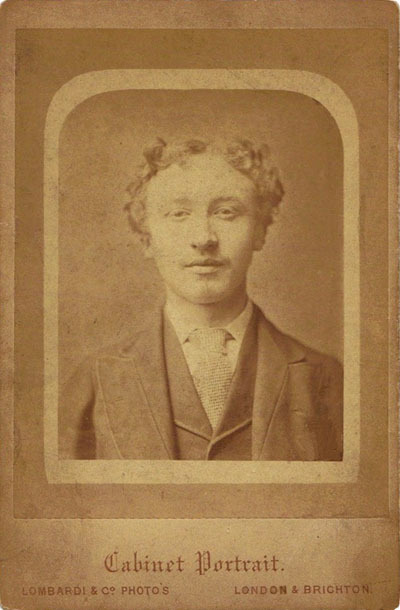 [ABOVE] A portrait of a young William Kessler (1859-1929), photographed in December 1874, shortly before he arrived in Brighton as a teenage musician. William Kessler's father, Ludwig Kessler (1834-1872) was a professional musician from Germany. 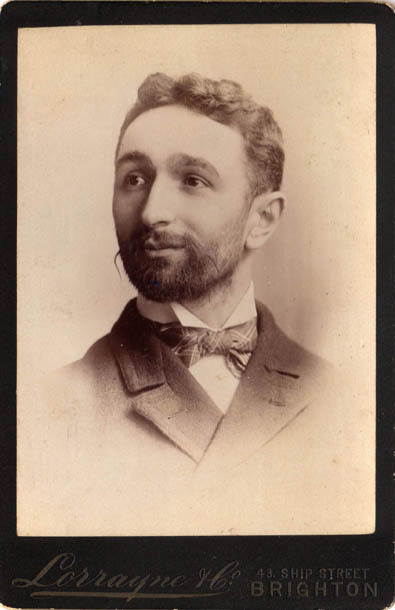 From 1875, William Kessler, who was then in his teens, earned his living as a professional musician. 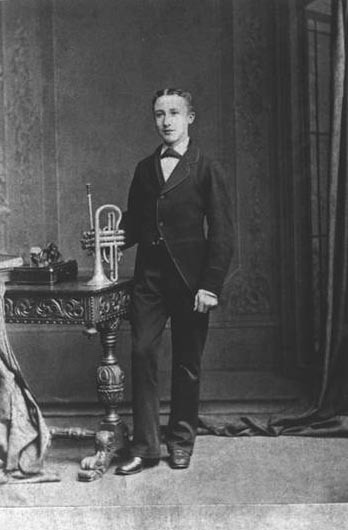 On the evidence of this portrait, William Kessler was a trumpeter or cornet player. There is also documentary evidence that William Kessler was a "teacher of Music" and a composer of music. This portrait was taken in Tunbridge Wells in the studio of David Robert Everest at 40 Grosvenor Road, Tunbridge Wells, and is inscribed "yours faithfully, L. W. Kessler, Dec.1874". 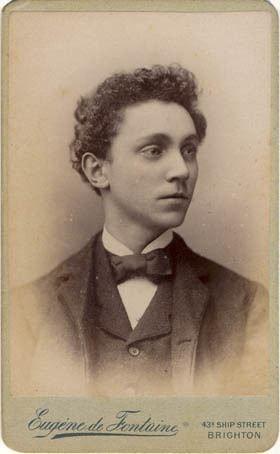 [ABOVE] A portrait of a William Kessler (1859-1929), photographed at Lombardi & Co.'s Brighton studio around 1878, when William was aged about 19. [RIGHT] A portrait of William Kessler as a 15 year old musician. William Kessler working as a photographer under the name of "Louis Kessler"
By 3rd September 1883, William Kessler was living in the centre of Brighton at 15 New Road, close to the Theatre Royal and a few doors away from the Oxford Music Hall of Varieties. Sometime between 1883 and 1887, William Kessler and his wife Eliza separated. It appears that Eliza Kessler left Brighton for London, taking her three eldest children with her. 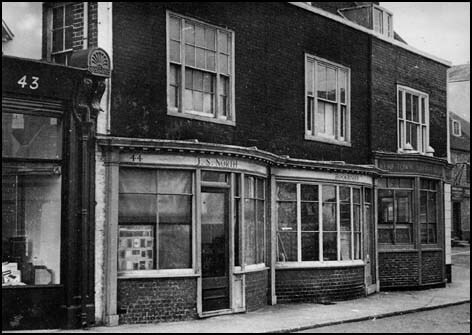 In 1883, the business premises at 15 New Road, Brighton was used as a tobacconist's shop by Mrs Rosina Streete, a 51 year old widow. In 1887, Mrs Streete allowed the room above her shop to be used as a photographic studio by one of her tenants. Page's Brighton Directory of 1888, lists Louis Kessler, a photographer, alongside Mrs Streete, tobacconist, at 15 New Road, Brighton. William Kessler appears to have adopted the first name of Louis for his photographic activities. 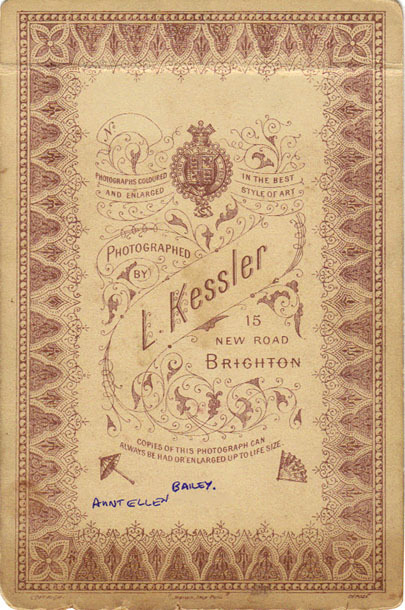 (Pike's 1888 Directory of Brighton lists "W. Kessler" as the photographer in business at 15 New Road, Brighton). While he was using the upstairs room at 15 New Road as a studio, William Kessler was residing at 72 Lewes Road, Brighton. 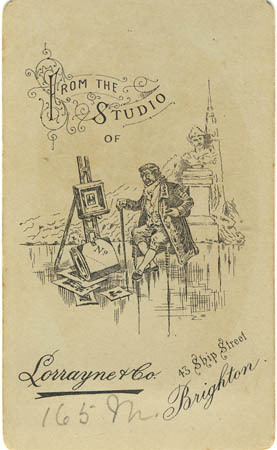 By the start of 1889, the studio of "Louis Kessler" at 15 New Road, Brighton, had been sold to the photographer Robert Armitage. [ABOVE] The Dome Cafe at 15 New Road, Brighton, the site of the photographic studio of "Louis Kessler". To the right of No. 15 is the large Empire Theatre building which was built in 1892, four years after "Louis Kessler" had vacated his studio in New Road. When this photograph was taken the Empire Theatre had become the Paris Continental Cinema. 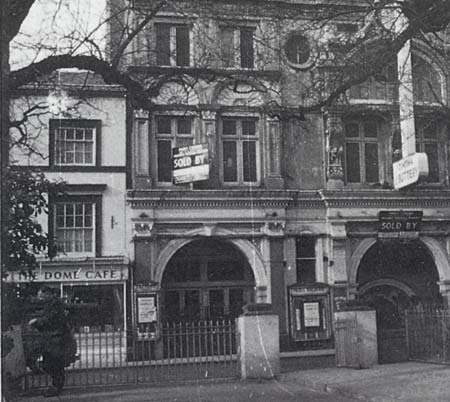 The cinema was demolished in 1967. 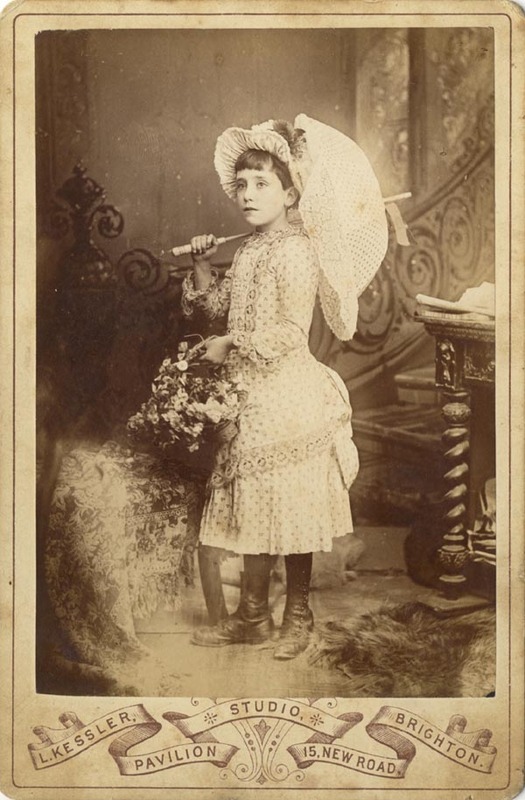 [ABOVE] A cabinet portrait of a girl holding a parasol, photographed by "L. Kessler" of the Pavilion Studio, 15 New Road, Brighton (c1888). [ABOVE & BELOW] Trade directory entries for a Brighton photographer named Kessler. Photographer W. Kessler is listed at 15 New Road, Brighton, in Pike's Brighton Directory of 1888 (above). W. Kessler of No. 1 Aberdeen Road, Brighton, is listed under "Photographers" in Page's 1890 Directory (below). In 1893, under the pseudonym of "Eugene de Fontaine", Kessler took over the photographic studio of Lorrayne & Co. at 43a Ship Street, Brighton. [ABOVE] The trade plate of "L. Kessler" photographer of the Pavilion Studio, 15 New Road, Brighton (c1888). Circumstantial evidence shows that William Kessler was operating as a photographer under the name of Louis Kessler between 1888 and 1890. 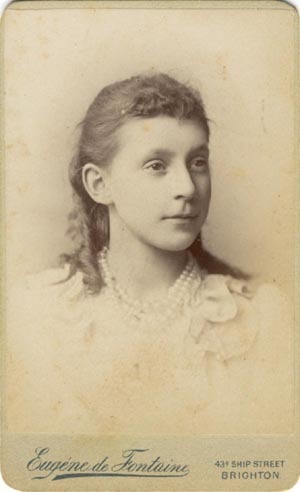 [PHOTO: COURTESY OF RAY KESSLER] [ABOVE] A portrait of Ellen Bailey, the sister of William Kessler's first wife, photographed at the studio of "L. Kessler" at the Pavilion Studio, 15 New Road, Brighton (c1888). 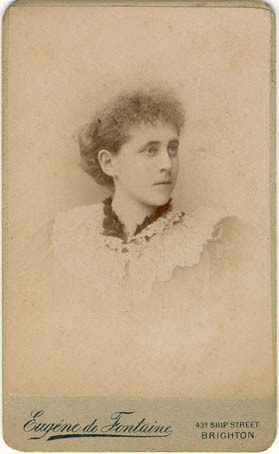 Ellen Bailey, the younger sister of Eliza Bailey, William Kessler's first wife, was born in Brighton in 1862. Before the end of 1889, a new photographic portrait studio opened at 43a Ship Street, Brighton under the name of Lorrayne & Co. Circumstantial evidence links William Kessler to the studio of Lorrayne & Co. The firm of Lorrayne & Co. operated from 43a Ship, Brighton from 1889 to 1892. 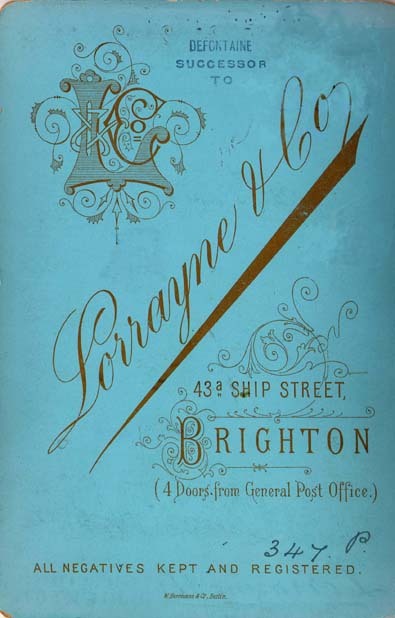 Lorrayne & Co. of 43a Ship Street, is listed under "Photographic Artists" in the commercial section of Page's 1890 Directory of Brighton, but, listed two names above this studio, is the entry "KESSLER, L. 1 Aberdeen Road". The 1890 and 1891 editions of Page's Brighton Street Directory lists Lorrayne & Co. at 43a Ship Street and 2 Elm Tree Cottages (Elm Tree Cottages were small tenements in a dead end road near 36 North Street, Brighton). 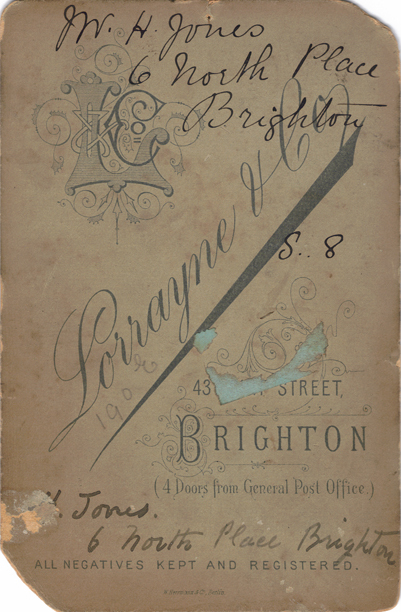 Pike's Brighton & Hove Blue Book of 1891, lists "Louis Lorrayne" as living at 53 Conway Street, Hove. Page's 1892 Street Directory of Brighton, which would have been compiled during 1891, lists Louis Lorrayne at 51 Clarendon Road, Hove, yet when the 1891 census was taken on 5th April, the occupant of 51 Clarendon Road is recorded as William H. Kessler, a thirty year old photographer. (In fact, William Henry Kessler celebrated his 32nd birthday on 5th April, 1891). Also living at 51 Clarendon Road was William's youngest son, Harold Kessler (born 1883, Brighton) - William Kessler's wife, Elizabeth, was living elsewhere in Brighton with their three other children - Arthur, aged 9, Charles, aged 11, and fourteen year old Annie (Mary Annie Louise). ** Residing with William Kessler and his eight year old son was a housekeeper, who is entered on the return as "E. Lyne", a single woman of thirty, who gives her place of birth as "Brighton, Sussex". 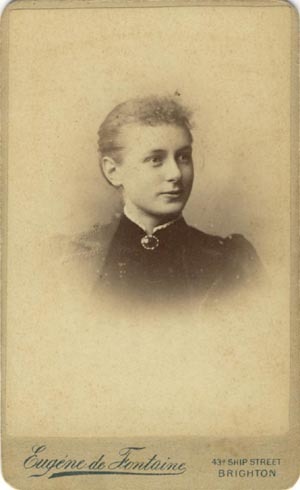 [The only exact match to this mysterious "E. Lyne" who was sharing William's home is Ellen Harriet Joan Lyne (born 1861, Brighton), the daughter of Captain Thomas Lyne (1826-1886), a widowed cavalry officer. Another candidate is Ellen Lynn (born c1860, Brighton), a married woman who, at one time, was lodging in the same street as Mrs Kessler, however this Ellen Lynn was recorded as a servant at another house in Brighton during the 1891 census). On the 1891 census return, William H. Kessler is entered as the Head of the Household and his occupation is given as "Photographer (employed)". This suggests that William Kessler was not a partner in the photographic firm of Lorrayne & Co. at 43 Ship Street, Brighton, yet it is odd that both "Louis Lorrayne" and William Kessler are both recorded as the occupants of 51 Clarendon Road, Hove. [Pike's 1892 Directory of Brighton gives the home address of Mr Louis Lorrayne as 51 Clarendon Road ]. I have not managed to find a "Louis Lorrayne" in the 1891 census for Brighton and this name does not feature in any of the registrations of births, marriages and deaths for England and Wales. The suggestion is that "Louis Lorrayne" was an assumed name and that "Lorrayne & Co." was used simply used as a trading name. Given that William Kessler seems to have previously operated as a photographer under the name of "Louis Kessler", it is possible that "Louis Lorrayne" was another of William's pseudonyms. [ABOVE] A cabinet portrait of a young man with a moustache, photographed by Lorrayne & Co. of 43 Ship Street, Brighton (c1890). [ABOVE] The reverse of a cabinet portrait produced by Lorrayne & Co. of 43 Ship Street, Brighton (c1891). ** Between 1896 and 1899, various Brighton & Hove Street Directories list Mrs Eliza Kessler, William Kessler's estranged wife, at 9 Lower Market Street, Hove. Kelly's 1899 Directory of Sussex lists Mrs Elizabeth Kessler as a lodging house keeper with apartments at 9 Lower Market Street, Hove. [ABOVE] A studio portrait of a couple posing by a rustic wooden fence. Cabinet photograph by Lorrayne & Co. of 43 Ship Street, Brighton (c1891). [ABOVE] A cabinet portrait of a young man with a moustache, photographed by Lorrayne & Co. of 43 Ship Street, Brighton (c1891). 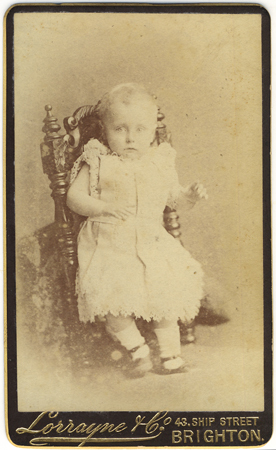 [ABOVE] A carte-de-visite portrait of a toddler, photographed at the studio of Lorrayne & Co. at 43 Ship Street, Brighton. (c1890) Negative No. 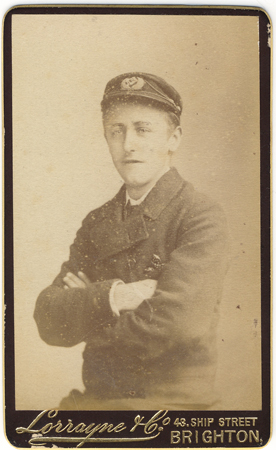 120 S [ABOVE] A carte-de-visite portrait of a young man in uniform, photographed at the studio of Lorrayne & Co. at 43 Ship Street, Brighton. 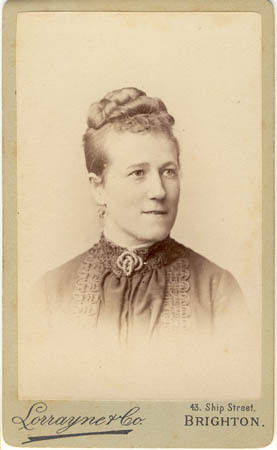 (c1890). Negative No.125 M [ABOVE] The reverse of the carte-de-visite portrait of a young man in uniform by Lorrayne & Co. shown on the left. 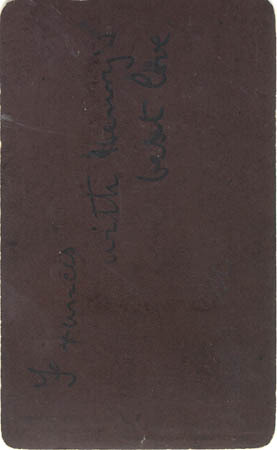 The back is inscribed "Francis with Henry's Best Love". 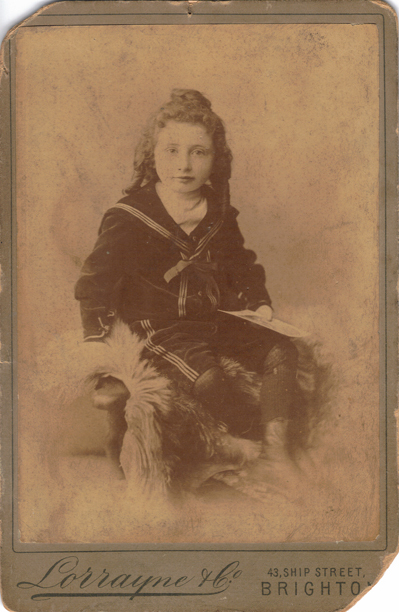 William Kessler operating as a photographer in Brighton under the name of "Eugene de Fontaine"
[ABOVE] A carte-de-visite portrait of an unknown girl from the studio of Eugene de Fontaine at 43A Ship Street, Brighton. (c1894). Negative No. 1250. [ABOVE] The decorative design on the reverse of a carte-de-visite portrait produced at Eugene de Fontaine's photographic studio at 43A Ship Street, Brighton. William Kessler working under the pseudonym of "Eugene de Fontaine"
Around 1893, the name of the studio at 43A Ship Street changed from Lorrayne & Co. to Eugene de Fontaine. The new proprietor of the studio at 43A Ship Street can be identified as William Kessler as he used "Eugene de Fontaine" as a nom-de-plume for the remainder of his photographic career and this name is also entered as an alias on his death certificate. 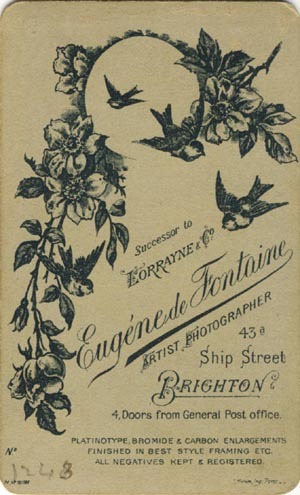 The studio of Eugene de Fontaine is listed under the heading of "Photographic Artists" in Brighton trade directories for the next three years (1893, 1894 and 1895) until it was acquired by William Hillmer (born 1849, Islington, London) around 1896. 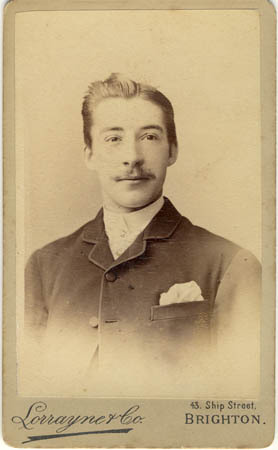 William Hillmer was based in Southampton and it is possible that he retained the services of William Kessler ("Eugene de Fontaine") as a studio manager or chief photographer in the Ship Street studio. 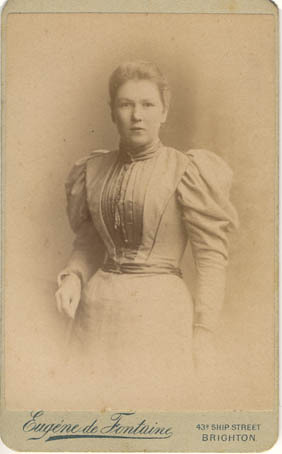 William Hillmer's new wife, Elizabeth Mentor (born 1861,Stepney, London), had owned photographic studios in Southampton and Portsmouth before she married William Hillmer in 1894. 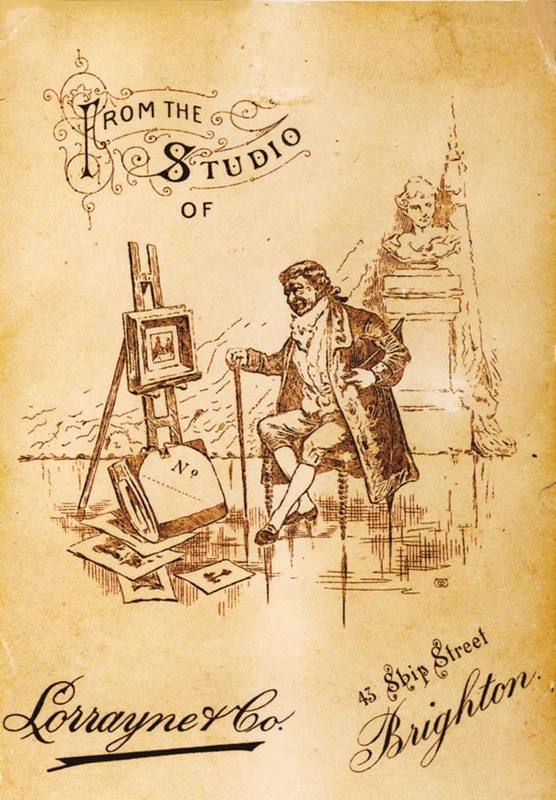 After their marriage, the studio in Southampton continued under the name of E. Mentor & Co, but after William Hillmer purchased Eugene de Fontaine's Brighton studio around 1896, the studio went under the name of William Hillmer & Co. Between 1896 and 1900, E. Mentor & Co. (the firm of photographers established by William Hillmer's wife Elizabeth Mentor) expanded rapidly. Over a five year period, E. Mentor & Co. opened studios at Newport on the Isle of Wight, Bournemouth, Southsea, Cheltenham, Wolverhampton, Birmingham, Coventry, Kidderminster, and at Barrow-in-Furness in Cumbria. By 1899, William Hillmer's studio at 43a Ship Street, Brighton was also carrying the name of E. Mentor & Co. It is possible that William Kessler (Eugene de Fontaine) was employed by E. Mentor & Co as a photographer at their studio in Brighton until the studio closed around 1900. Interestingly, as soon as E. Mentor & Co. closed their Brighton branch studio at 43A Ship Street, Brighton. Eugene de Fontaine emerged again as a studio proprietor, this time in the Brighton suburb of Portslade. 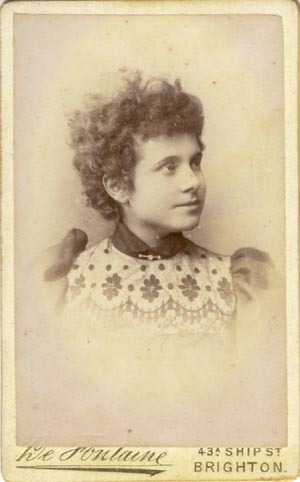 [ABOVE] A carte-de-visite portrait of a young woman from the studio of Eugene de Fontaine at 43A Ship Street, Brighton. (c1894). Negative No. 1243. [ABOVE] A carte-de-visite portrait of a young woman from the studio of Eugene de Fontaine at 43A Ship Street, Brighton. (c1893). Negative No. 516. Portrait of James Thomas Sharp North, bookbinder of Brighton, photographed by "Eugene Defontaine" (William Kessler) of 43a Ship Street, Brighton. [ABOVE] The reverse of a cabinet portrait produced by "Eugene De Fontaine" successor to Lorrayne & Co., 43a Ship Street, Brighton (c1893). The Lorrayne & Co. trade plate has been amended by a rubber stamp. The rubber-stamped addition reads "DE FONTAINE SUCCESSOR TO ... (Lorrayne & Co.)". 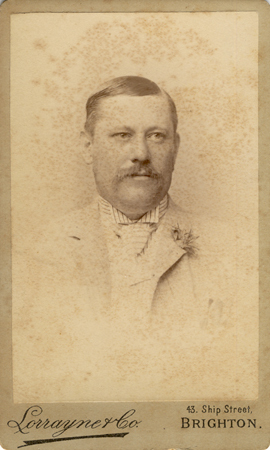 In 1893, William Kessler, working under the pseudonym of "Eugene de Fontaine" was using old photographic mount cards originally produced for Lorrayne & Co.
[ PHOTO: Courtesy of Julia Sherborne ] [ABOVE] A cabinet portrait of James Thomas Sharp North, bookbinder, photographed by "Eugene De Fontaine" (William Kessler) successor to Lorrayne & Co. of 43a Ship Street, Brighton (c1893). William Kessler, working under the pseudonym of Eugene de Fontaine, used Lorrayne & Co.'s photographic mounts in the early part of 1893, stamping "DE FONTAINE" on the reverse of the cabinet cards. James Thomas Sharp North, bookbinder of Brighton, photographed by "Eugene Defontaine" (William Kessler) of 43a Ship Street, Brighton. [ABOVE] A carte-de-visite portrait of a young man photographed at the studio of Eugene de Fontaine at 43A Ship Street, Brighton. The sitter is recorded as "Green". [ABOVE] A carte-de-visite portrait of a an unknown girl photographed at the studio of Eugene de Fontaine at 43A Ship Street, Brighton (c1895). [ABOVE] A carte-de-visite portrait of a young woman photographed at the studio of Eugene de Fontaine at 43A Ship Street, Brighton (c1894). Negative No. 1047. William Kessler trading as a photographer in Portslade as "Fontaine & Co."
[ABOVE] A cabinet portrait of a young man in uniform holding a rifle, photographed by Fontaine & Co. of Portslade, Brighton (circa 1900). Anne Grimshaw has identified the young soldier as a member of the Royal Sussex Regiment, possibly a Volunteer in the Militia. The Infirmary, Eastbourne, where Henry Kessler spent his last years. When the 1901 census was taken, William Kessler was living under the name of Eugene Fontaine. The census return for Lyndale, 20 Carlton Terrace, Southern Cross, Portslade records Eugene Fontaine as a self-employed photographer, aged 42. 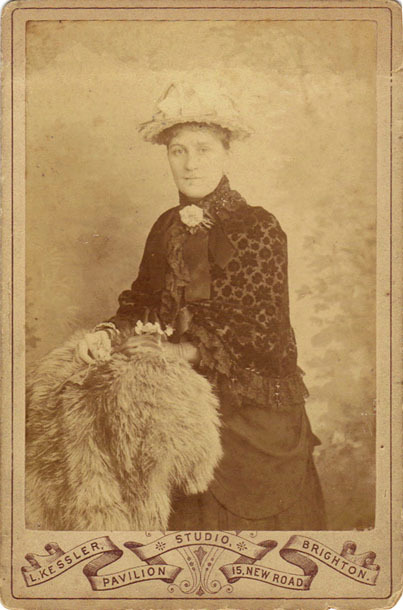 Also living at 20 Carlton Terrace, Portslade, was Fanny Fontaine, a thirty-two year old photographer, who is entered on the census return as Eugene's wife. Presumably, Fanny was William Kessler's common-law wife. His legal wife, Eliza or Elizabeth Kessler (1861-1942) was still alive in 1901 and there is no record of William's divorce or re-marriage. At the time of the 1901 census, William's youngest son, eighteen year old Harold Kessler was living at his grandmother's house in Deptford. 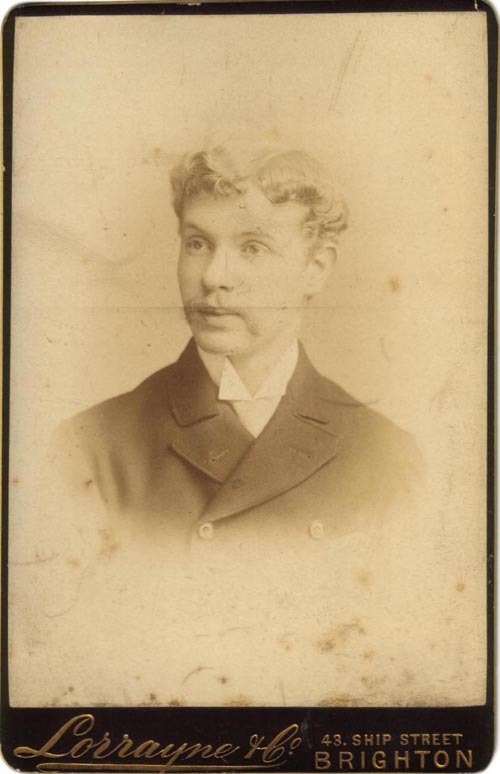 In 1901, William Kessler's son Arthur Francis Kessler was working in service as a footman in a household in Bedfordshire and his daughter Mary Annie Louise Kessler (born 1877, Dulwich) was employed as a housemaid in London. Mary Annie Louise Kessler (generally known as "Annie") married on 22nd December 1906. Like her companion (William Kessler/ Eugene de Fontaine), Fanny Fontaine (born c 1868 Hampstead, London ), is recorded as a "Photographer" working "at home" on her "own account". Eugene Fontaine (William Kessler) and Fanny Fontaine appear to have combined forces to form the photography firm of Fontaine & Co. Bennett's Business Directory of 1902 records the firm of Fontaine & Co. at 20 Carlton Terrace, Southern Cross, Portslade. The Fontaines appear to have left Portslade around 1903. The 1904-1905 edition of Bennett's Business Directory lists Walter Le Hair at Lyndale, 20 Carlton Terrace, Southern Cross, Portslade. Walter Le Hair was not yet another fancy nom-de-plume adopted by William Kessler. Walter Le Hair (born 1883, Grantham, Lincolnshire) had been employed by a factory manufacturing agricultural implements before he moved down from Grantham to Portslade on the Sussex coast. William Kessler virtually disappears from the historical record during the next eight years, yet there is evidence to indicate that William Kessler was still working as a photographer after he left Portslade. When Annie Kessler married in 1906, she gave her father's occupation as "Photographer". William Kessler, in the guise of Eugene Fontaine, re-appeared as a musician and photographer in Eastbourne, Sussex, around 1910. At the time of the 1911 census, Eugene Fontaine was living with forty-one year old Fanny Fontaine at 323 Seaside, Eastbourne. On the 1911 census return, Eugene Fontaine is recorded as a fifty-one year old "Musician". No occupation or profession is given for Fanny Fontaine, who declared that she had been married to "Eugene Fontaine" (William Kessler) for a period of 17 years (i.e. since 1894). Eugene Fontaine (William Kessler) parted company with Fanny Fontaine sometime before 1918. ( Mrs Fanny Fontaine is recorded at 41 Sydney Road, Eastbourne in 1924 and she is listed in local street directories at different addresses in Eastbourne over the next few years. Fanny Fontaine died in Eastbourne in 1927 aged 59). In 1918, "Eugene Fontaine" (William Kessler) married twenty-two year old Maud Isabel Fleck (born 1896, High Wycombe), the daughter of William Fleck, an Irish doctor. Eugene Fontaine's young wife gave birth to three children in the space of four years - Louis Fontaine (born 1919, Eastbourne), Rosalind Fontaine (born 1920, Eastbourne) and Ronald Fontaine (born 1922, Eastbourne). During this period, Eugene Fontaine (William Kessler) was residing at 18 Willowfield Road, Eastbourne, with his new wife and children. Sometime after 1922, William Kessler (Eugene Fontaine) was admitted to the Infirmary in Eastbourne's Church Street. Formerly part of the Eastbourne Union Workhouse, No. 123 Church Street had been designated an infirmary for the old and infirm. 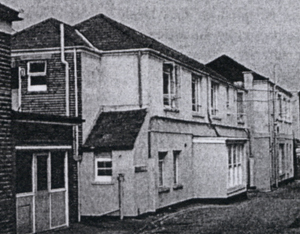 ( In 1930, the Institution and Infirmary in Church Street became St. Mary's Hospital, Eastbourne). William Kessler was suffering from chronic bronchitis and during the winter months of early 1929 he was showing symptoms of hypostatic pneumonia. William Kessler (Eugene Fontaine) died at Eastbourne's Institution & Infirmary in Church Street on 18th March, 1929 at the age of 71. The death certificate for William Kessler records his alias of "Eugene Fontaine". William Kessler is described on the death certificate as a "Photographer", formerly of 18 Willowfield Road, Eastbourne. William Henry Kessler, also known as Eugene Fontaine, was buried as a pauper in a common grave on 21st March 1929. Can you identify this young man's uniform ? The portrait of the young man in uniform holding a rifle (see above, left) was probably photographed around 1900 at Portslade by William Kessler (Eugene Fontaine) or his partner Fanny Fontaine. On the left, I have shown details from the photograph, showing the collar badges and the badge on the belt worn by the young soldier. If anyone viewing this page can identify the young man's uniform or regiment, or provide any further details about the photograph, would they please contact me by e-mail. My e-mail address can be found on the Home Page of Sussex PhotoHistory. Since I placed this photograph on the webpage and appealed for information, I have received a response from Anne Grimshaw, who has recently been studying a group photograph by Fontaine & Co. which features members of the Royal Sussex Regiment. (See the photo at the foot of this webpage). Anne was able to identify the regiment by studying the badges on the caps, belt buckles and collars of the men's uniform. Having established that the uniformed soldiers in the group portrait were sergeants and other NCOs in the Royal Sussex Regiment, Anne noticed that the young soldier in the photograph by Fontaine & Co. (above left) was wearing a uniform displaying identical regimental badges. Ann Grimshaw concluded that the young soldier with the rifle and the NCOs in the larger photograph by Fontaine & Co. were all members of the Royal Sussex Regiment. 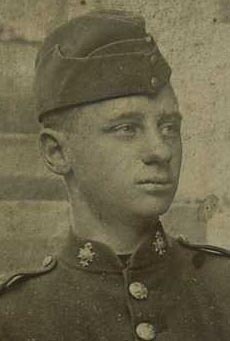 This young soldier was possibly a Volunteer in the Royal Sussex Regiment Militia, which served in South Africa during the Second Boer War (1899-1902). [ABOVE] A cabinet portrait of a young man in uniform holding a rifle, photographed by Fontaine & Co. of Portslade, Brighton (circa 1900). Both Graham Russel and Anne Grimshaw has identified the young soldier as a member of the Royal Sussex Regiment. 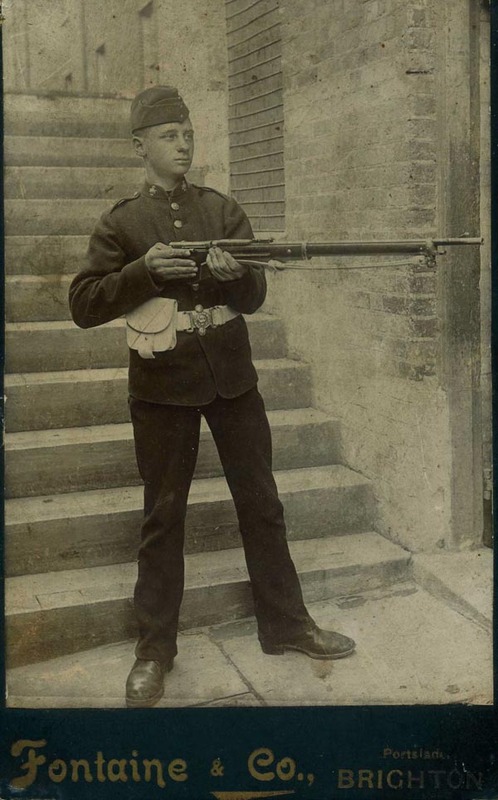 As the young man is not in full regimental uniform and is holding an outdated rifle, he was possibly serving in the Royal Sussex Militia or a Volunteer Unit which joined the 1st Battalion of the Royal Sussex during the Second Boer War (1899-1902). Both Graham Russel and Anne Grimshaw identified the young man's regiment as the Royal Sussex from the distinctive regimental collar badges. (See the illustration of a Royal Sussex Regiment collar badge opposite). "The soldier shown here appears to be wearing the 'undress' uniform of a British Army infantry private dating from probably about 1895-1899. There is a version of the glengarry forage cap on his head (phased out in 1902). His jacket here is scarlet worn with dark blue trousers; very striking but a less fancy version compared to 'full dress'. (See the illustration on the right). The distinctive white pouch would have been for ammunition. The rifle in his hands is the Lee-Metford, adopted by the British army from 1888. This design of rifle was replaced by the Lee-Enfield from 1895. (Replacement of the Lee-Metford rifle took several years to achieve, and it was still in service in some units in 1899, so this picture could be somewhere between 1888 and 1899; and no later than 1902 going by his headgear.)" [ABOVE] A metal collar badge for a volunteer battalion of the Royal Sussex Regiment. 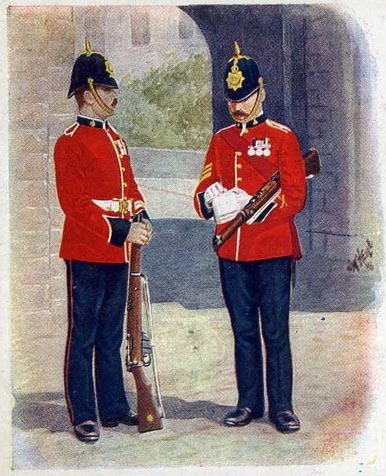 [ABOVE] A Private and Sergeant of the Royal Sussex Regiment in Full Dress Uniform, a colour illustration taken from a picture postcard published around 1910. In this picture, the two soldiers are shown wearing the spike-topped home service helmet. On less formal occasions, the preferred headgear for sergeants and other ranks during the Boer War period was the "Glengarry style" forage cap made from cloth. This flexible cloth cap could be rolled or folded when not worn. 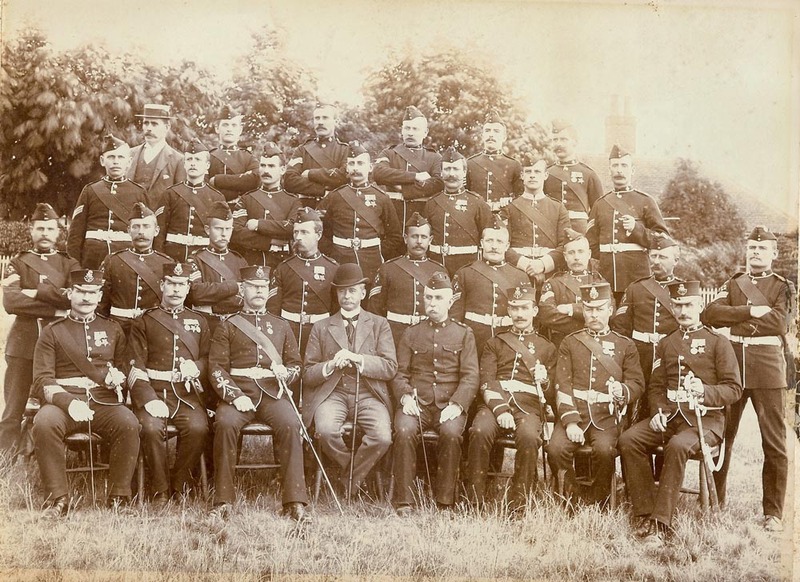 The young soldier in the Fontaine & Co. cabinet photograph (see photo far left) and the majority of the sergeants in the large group photograph of NCOs in the Royal Sussex Regiment (see photo below) wear "Glengarry style" forage caps. When on active service in the Boer War, the Royal Sussex, like other British regiments wore a Khaki ("dust-coloured") uniform. "Not surprisingly, the close up shows it's the locals: the Royal Sussex Regiment. The belt buckle is just the standard British Army 'other ranks' one. But the collar badge is unique. It consists of a Maltese cross overlaying a feather - the Roussillon plume. On the centre of the Maltese cross is superimposed the round central part of the Garter Star, i.e., a St George's Cross surrounded by the Garter, and around this is a wreath of laurels. (See the illustration bottom right). This is clearly visible as the rounded 'bump' in the middle of the collar badge. N.B. The collar and cuffs ('facings') of the uniform really ought to be blue, I think, as a Royal Regiment; not sure why they don't quite look dark enough here, but the distinctive badge does makes it certain it's the Royal Sussex Regiment." Thanks to the My Brighton & Hove website for featuring the Fontaine & Co. photograph of the young soldier as a "Mystery Photograph" and inviting comments from visitors to their website. The comments and observations made by Graham Russel have proved most useful in identifying the uniform worn by the young soldier. I am grateful to Dennis Parrett for providing a copy of the Fontaine & Co. photograph and for passing on Graham Russel's comments about the subject of the photo. [ABOVE] A large group portrait by Fontaine & Co. of Portslade, Brighton (circa 1900). The group comprises of thirty individuals, the majority of whom are sergeants and other NCOs wearing the uniform of the Royal Sussex Regiment. Anne Grimshaw, who kindly forwarded this photograph to me, has identified the Non-Commissioned Officers as members of the Royal Sussex Regiment. Anne Grimshaw noticed that a number of the senior soldiers were wearing the Egypt Campaign Medal of 1882 and the associated Khedive's Star, a bronze medal awarded to Army personnel by Tewfik Pasha, the Khedive of Egypt. This sepia photograph shows the men's uniform in monochrome, but in reality the uniform of the Royal Sussex Regiment consisted of a scarlet red frock tunic, edged with white piping, a white buff leather belt, and dark blue trousers. The facings on the cuffs and collar of the red tunic were dark blue, yet the sashes would have been red in colour. (See the full-colour illustration above right). Most of the men wear a "Glengarry" style cap, but in the front row, six of the senior men wear "pill-box" type peaked caps. This group portrait of NCOs of the Royal Sussex Regiment was probably taken by Fontaine & Co. during the period 1899-1902. Eugene de Fontaine (aka William Kessler) established his photography business at 20 Carlton Terrace, Portslade in 1899 or 1900. The photograph was therefore taken during the years of the Second Boer War, which lasted from October 1899 until May 1902. Both the 1st Battalion and the 3rd Battalion of the Royal Sussex Regiment were posted to South Africa during the Second Boer War. The 1st Battalion, the Royal Sussex sailed for Malta, on route to South Africa, in October 1899, arriving at the Cape in March 1900. The 1st Battalion was reinforced by Volunteer Active Service Companies, formed from the Royal Sussex Militia and Volunteer Units of the Royal Sussex Regiment. The 3rd (Militia) Battalion of the Royal Sussex Regiment (consisting of nearly two dozen officers and 480 men) embarked from London's Albert Dock on 29th March 1901, arriving at the Cape Colony in South Africa in April 1901. The identity of the NCOs of the Royal Sussex Regiment featured in Fontaine & Co.'s group photograph is unknown, but the following sergeants of the Royal Sussex are known to have served in South Africa during the Second Boer War, between March 1900 and May 1902: Sergeant-Major Charles Amos, DCM; Sergeant-Major S. Thwaites (died 1902); Colour-Sergeant Bartholomew; Colour-Sergeant P. Jones MC; Colour-Sergeant A. Nye, DCM; Colour-Sergeant A. E. Weston (died 1901); Colour-Sergeant White; Sergeant E. Boniface; Sergeant H. Coomber; Sergeant T. I. Curton; Sergeant T. Gates, DCM. ; Sergeant W. F. Phillips; Sergeant H. Snaith, DCM; Lance-Sergeant A. Ockelford, DCM; 1st BATTALION: Sergeant-Major Day; Sergeant-Major Thwaites (died 1902); Colour-Sergeant G. A. Gosling (died 1901); Colour-Sergeant Thomas Albert Jones; Colour-Sergeant M. Mockingford (died) or Colour-Sergeant H Mockford (died) ; Colour-Sergeant A. E. Weston (died); Sergeant T. L. Carlton (died); Sergeant Costham; Sergeant Dyer; Sergeant Evans; Sergeant Finucane; Sergeant S. Gilham (died); Sergeant C. Green (died 1902) ;Sergeant Hastings; Sergeant Hersee; Sergeant Leech; Sergeant Maxfield; Sergeant F. W. Nightingale (died) ; Sergeant Patching; Sergeant Smith; Sergeant W. A. Walters (died) ; Sergeant Williamson. 3rd BATTALION: Colour-Sergeant George Penfold (died 1902); Sergeant A. Andrews (died); Sergeant Donovan; Sergeant Fuller; Sergeant Galop; Sergeant Keene; Sergeant G. King; Sergeant Lawton; Sergeant Linfield ; Sergeant Mynett; Sergeant Samways; Sergeant Smith; Sergeant Thorne. The group portrait of the NCOs of the Royal Sussex Regiment taken by Fontaine & Co. of Carlton Terrace, Portslade was originally owned by a Mr Ritchie (The name "Ritchie" is inscribed on the reverse of the photograph). Thanks to Peter Kessler for providing details of William Kessler's family history and the portrait of William Kessler as a young musician. Peter Kessler is the great grandson of William Kessler. Peter's grandfather was Charles Ludwig Kessler (born 1879, Brighton), William Kessler's eldest son. Information about the Kessler Family has also been provided by Ray Kessler, a great grandson of William Kessler. Thanks to Dennis Parrett for providing Fontaine & Co.'s photograph of the young soldier. Thanks also to the Brighton History Centre for allowing me to feature front and reverse of the cabinet photograph by Lorrayne & Co. of Brighton. Thanks to Jennifer and Colin Gorton of Queensland Australia. for providing the Lorrayne & Co. portrait photograph of Abraham Julius Jones, Colin's grandfather. Thanks to Julia Sherborne for providing the portrait of James T. S. North, photographed by "Eugene De Fontaine" (William Kessler) of 43a Ship Street, Brighton. My thanks also goes to Liz Cole of Sudbury and Anne Grimshaw, two members of the Suffolk Family History Society, who allowed me to feature the large group portrait of Non-Commissioned Officers in the Royal Sussex Regiment, photographed by Fontaine & Co. of Portslade around 1900. Both Anne Grimshaw and Graham Russel, a contributor to the My Brighton & Hove website, helped identify the uniform of the young soldier depicted in the Fontaine & Co. photograph owned by Dennis Parrett. PRIMARY SOURCES - Street and Trade Directories : W. T. Pike's Brighton and Hove Directory and Local Blue Book (1888,1889,1892,1896,1897,1898,1899,1900,1901,1902,1903, 1904,1905,1906,1907,1908,1910,1911 & 1912) ; Page's General Directory for Brighton & Hove (1875,1876,1877,1879,1880,1890,1891,1893,1894 &1895) ; Walser & Grist's Popular Shilling Directory for Brighton (1888) ; H. & J. Barnes' Popular Directory for Brighton, Hove and Preston (1895,1896) ; Towner's Brighton and Suburban Directory (1896,1898,1899, 1900, 1901,1902,1903,1904,1905, 1906,1907 & 1908) ; Kelly's Post Office Directory for Sussex (1874,1878, 1882,1887,1890,1891,1893,1894,1897,1899,1911,1913,1915,1918,1922 ) ; Post Office London Directory (1882) ; Business Directory of London (1884). Pikes's Eastbourne, Hailsham & District Local Directory (1920 and 1921), Gowland's Eastbourne Directory (1922). WEBSITES : Births, Marriages & Deaths Records on FreeBMD ; 1881 Census & International Genealogical Index on LDS Family Search. Census returns were also explored on the UK Census Collection featured on the ancestry.co.uk website, 1901 Census Online and the 1911 Census website. My Brighton and Hove community website. The Royal Sussex Living History website has proved very useful in determining details of the uniform of The Royal Sussex Regiment during the Boer War period. An article on the same website by Christine Payne concerning her grandfather, John Marshall Patching (1874-1950), who served in the 1st Battalion of the The Royal Sussex Regiment during the Boer War, also proved to be very useful in my research into the composition and movements of The Royal Sussex Regiment during the period 1899-1902. OTHER SOURCES - Books : Victorian and Edwardian Brighton from Old Photographs by John Betjeman and J. S. Gray (B. T. Batsford Ltd, 1972) ; The Encyclopaedia of Brighton by Timothy Carder (East Sussex County Council Libraries,1990) ; A Pictorial History of Brighton by John Roles & David Beevers (Breedon Books & Brighton Borough Council, 1993).